This video is a great way to get acquainted with EMDR and learn how it can help you. ​Eye Movement Desensitization and Reprocessing (EMDR) Therapy offers lasting relief from various kinds of emotional distress. The exact process of any form of psychotherapy is unknown. Nonetheless, studies indicate that when someone is extremely upset or traumatized his or her brain is unable to process information the same way it usually does. EMDR can help. When you revisit a traumatic or disturbing event or moment in your mind, the memory itself may be as upsetting as it was initially. This happens because the sounds, smells, images and feelings remain the same. These traumatic memories create a long-lasting negative effect that can interfere with your perception of the world. These memories also have an impact on the way you relate to others. EMDR is a physiologically based therapy designed to help you view disturbing material in a new way, easing feelings of distress and discomfort. EMDR therapy helps you develop new insight and awareness which allows you to replace negative beliefs and painful emotions with positive thoughts and feelings. People who are suffering from post-traumatic stress disorder (PTSD) as well as depressive and anxiety based disorders. People who have suffered excess loss (death, divorce and loss of home, etc) or childhood abuse or neglect. People who have witnessed or have been the victim of a natural disaster (tornadoes, earthquakes and hurricanes, etc). People who are struggling with addiction. According to scientific research, EMDR is the quickest and most effective method for healing PTSD. EMDR Therapy is an evidenced-based practice that is listed with the National Registry of Evidenced Based Practices and Programs (NREPP), as well as with the Substance Abuse Mental Health Services Administration (SAMHSA). The Department of Veterans Affairs (VA), the World Health Organization (WHO) and the American Psychological Association (APA) have all endorsed EMDR as a preferred treatment for PTSD. During your EMDR therapy with me, your eyes may be stimulated repeatedly, you may receive tactile stimulation (touch) or hear sounds repeatedly. My goal is to continually activate opposite sides of your brain. These repeated stimulations help release emotional experiences that became trapped in your nervous system at the time the traumatic event occurred. This blockage is negatively affecting your neurophysiological system, which is where the connection between your mind and body begins. The release of these emotional experiences eliminates these blockages and assists your neurophysiological system in reconnecting itself. During your Eye Movement Desensitization and Reprocessing (EMDR) Therapy session, I will ask you to revisit a disturbing or traumatic incident that is negatively affecting your life. You will need to recall the feelings, negative thoughts and memories associated with this particular incident or moment. As you visualize this incident, you will receive bilateral stimulation by allowing your eyes to follow a light or my fingers, simulating the movement that takes place in REM state when you are dreaming. While you focus on the lights, your eye movements process these images. This reprocessing results in the exchange of painful feelings for more loving, peaceful and resolved feelings. After a successful EMDR session, you will no longer relive the sounds, images and feelings associated with the traumatic incident or moment that we focused on. You will still remember the event; however, it will be less upsetting to you. Your EMDR therapy session has essentially rebooted your brain concerning these past disturbances. This allows you to view them in a new, less distressing way. 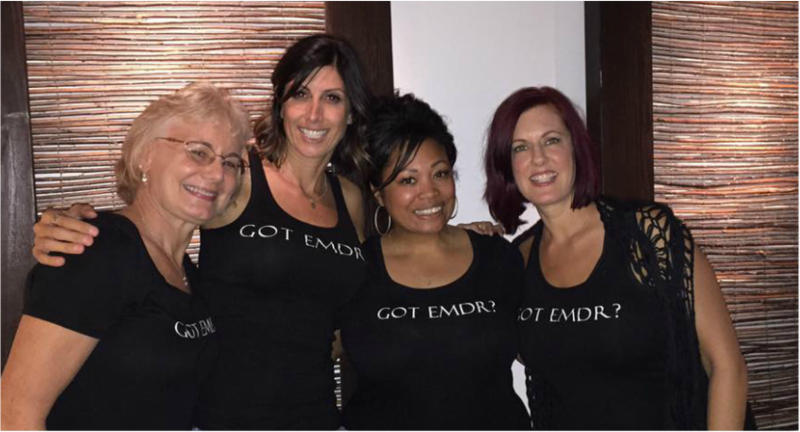 Click here to learn more about EMDR and how it can help you recover from trauma. Everyone Experiences Trauma - Healthy Cells Magazine article - click the link to read an article I wrote about about attachment trauma for the May 2017 issue.